Founding the women’s klapa Čuvite cannot be determined by a special date or event. Klapa simply formed through gatherings inspired by love toward the island and singing as traditional way of communication. As klapa isn’t just a synonym for singing but also for companionship, so the klapa came to being thorough intense meetings of those in love with their island and those who came to Šolta by following their love. These meetings joined women from Germany, Slovenia, Korčula, and the first artistic leader of Čuvite became prof. Marija Brunsko, academic musician and retired member of the Maribor opera. Organized klapa singing on Šolta was started by women with the greatest support from their beloved men. The initiative for organizing women’s klapa launched a real avalanche of interest for singing at the island, which resulted in foundation of children and women choir, girl’s and women’s klapa and the official registration of Cultural-Artistic Society Šolta in 1998. For fifteen years of organized klapa singing, first under the leadership of maestro Brunsko, and since 2008 maestro Srećko Damjanović, Čuvite attract the attention of klapa music lovers and spread klapa music on Croatian and international stages with their sensible singing. 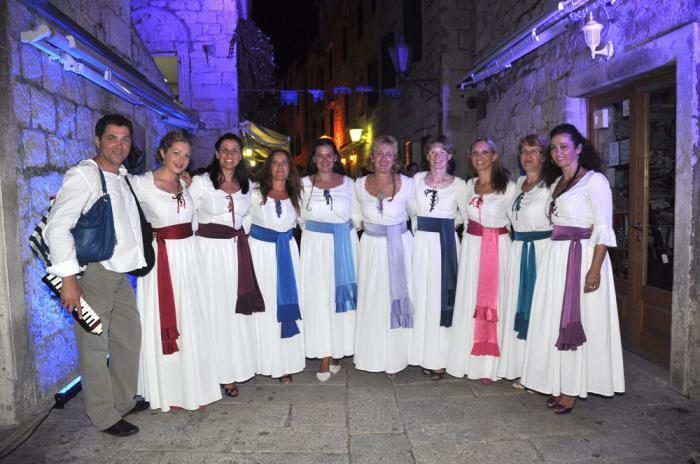 They were the first klapa from the island of Šolta to participate at the Festival of the Dalmatian Klapa in Omiš in 2002. Hard work and love toward klapa singing brought Čuvite many successful performances and prestigious awards at the Evening of Dalmatian Songs in Kaštela, Festival of the Dalmatian Klapa in Omiš, Festival of the Island Klapas in Supetar, International Choral Festival in Verona. The crown of their dedicated work was the Golden shield at the 46th Festival of the Dalmatian Klapa in Omiš in 2013. At the 47th Festival of the Dalmatian Klapa in Omiš, Čuvite won the Silver shield. They have released an album Barka posrid srca in 2005, which was recorded in St. Martin’s Church in Donje selo. Why Čuvite? Čuvita is a small owl from Šolta, whose night song bonds Čuvite even more closely to their island, in order to attract more people to Šolta which proudly spawned the women’s klapa, winner of Omiš, from only 1500 inhabitants. The artistic director of the women’s klapa Čuvite is Srećko Damjanović.